We strive to offer the lowest prices for our quality products and your complete satisfaction is our number one priority here at Horse Tack Now. This product is made with an elegant, simple yet a very modern style design. This happens to be one of our best selling Horse Hackamores that we have offer. 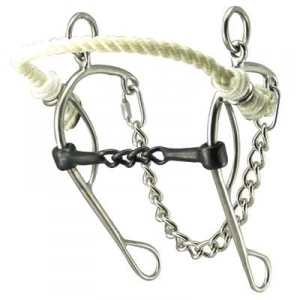 This hackamore combo with rope nose measures 7'' in the shanks and is made of top quality materials. When buying a horse hackamore at Horse Tack Now rest assured you are getting the highest quality at discount prices.